Fluorescence Microscopy를 이용하여 living cells의 DNA/RNA만 선택적으로 Detection할 수 있습니다. which will then generate reactive oxygen species that are toxic to cells. 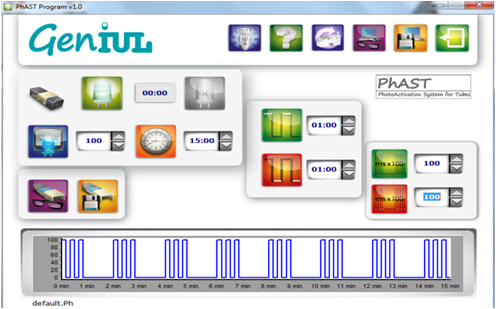 - Efficiency : High power LED로 최상의 cross-link efficiency제공. - Reproducibility : 뛰어난 재현성과 manual photoactivation의 오차 없음. 균일하게 안정된 빛의 조사로 동시에 12 samples을 photoactivation. - Flexibility : 빛의 세기, 조사시간 등의 조절로 최적의 staining 조건 제공. 장비 뚜껑 덮고 Power On. Sample is ready. DNA from dead cells has been neutralized. For Elisa plates, Culture plates and Bottles, Petri Dishes and Filtration membranes. 균일하게 안정된 빛의 조사로 다양한 용기내의 샘플을 photoactivation. PhotoActivation System neutralizes the DNA/RNA of dead organisms through the use of photoactivable intercalating reagents. different heights for optimizing the exposure. For handling reaction tubes in a light protective environment and isothermal incubation. - During all the steps previous to DNA neutralization by the means of photo-activation. 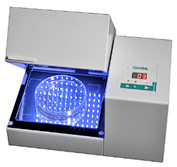 cases it is also very important to ensure temperature stability during the incubation time. - The dark box system combines these characteristics and is therefore the best solution for handling your samples during viability PCR process. optimized, as well minimizing the reagents access to live microorganism. - The tube rack can be placed into a fridge or a microbiological incubator to reach the appropriate temperature. For removal of DNA intercalating dyes from aqueous solutions..
- D-Bag system은 실험에 사용된 다양한 DNA dyes 제거에 안전하고 효율적인 방법입니다. specific intercalating dyes, Et-Br, Propidium Iodide or their derivatives PMA and EMA. 나머지 용액은 안전하게 버려질 수 있습니다. - D-bag은 일정 횟수 재사용이 가능합니다. ( ~ 800 vPCR microtubes). Avoid manipulation of toxic solutions and the transfer to vessels for applying decontamination treatments. D-Bag ensures the minimal manipulation possible. decontamination and preventing accidental release of particles containing toxic substances.